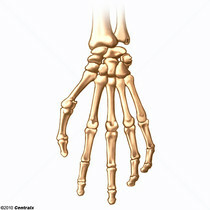 The CARPAL BONES; METACARPAL BONES; and FINGER PHALANGES. 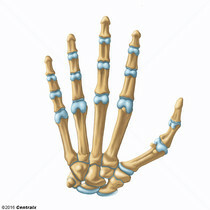 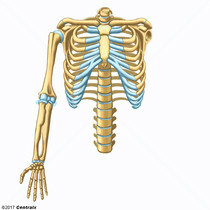 In each hand there are eight carpal bones, five metacarpal bones, and 14 phalanges. 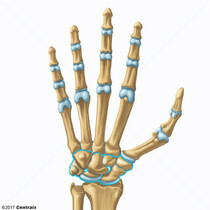 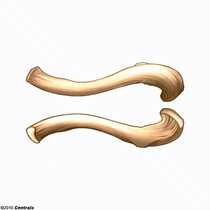 Bones that make up the SKELETON of the FINGERS, consisting of two for the THUMB, and three for each of the other fingers. 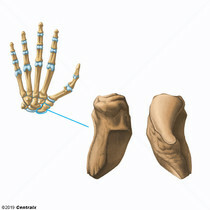 A carpal bone located between the CAPITATE BONE and the TRIQUETRUM BONE. 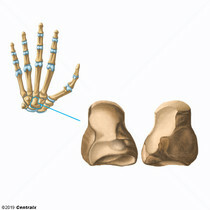 The hamate has a prominent process that projects anteriorly. 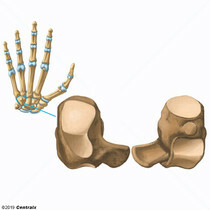 A carpal bone with a rounded head located between the TRAPEZOID BONE and the HAMATE BONE. 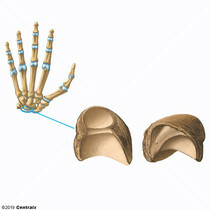 A moon-shaped carpal bone which is located between the SCAPHOID BONE and TRIQUETRUM BONE. 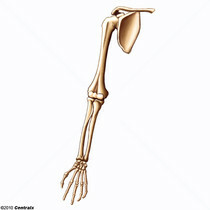 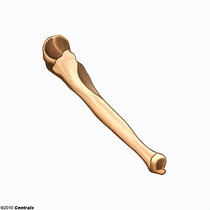 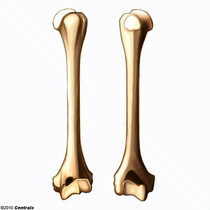 The bones of the free part of the upper extremity including the HUMERUS; RADIUS; and ULNA. 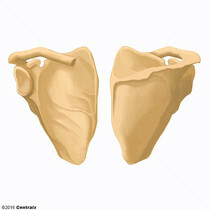 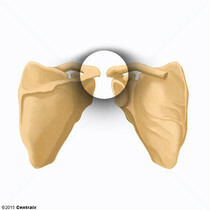 The lateral extension of the spine of the SCAPULA and the highest point of the SHOULDER.